DO YOU HAVE A REFERENCE LIST FOR TYPE, SIZE & COLOR BLEND CODES? DO YOU OFFER REFUNDS OR EVER SUBSTITUTE PRODUCTS? DO YOU SELL FRESH CUT FLOWERS? WE OFFER CUT FLOWERS TO DECORATE YOUR HOME WITH, OR FOR WEDDINGS OR OTHER SPECIAL OCCASIONS!! However, we can only sell our cut flowers locally, as we are not equipped to ship them. HOW DO I CUT MY DAHLIAS? CUTTING DAHLIAS: Cut early in the morning or late at night. Place flowers immediately into hot (130) degree water, then set aside in a cool draft free area to cool for 2 hours before arranging. When arranging your flowers remove any leaves that would be under water. Display your flowers in a cool part of your home out of direct sunlight. By misting regularly, changing the water every other day, and re-cutting the stems your blooms will last several days. HOW DO I DEAL WITH SLUGS? HOW DO I DECIDE WHERE TO PLANT MY DAHLIAS? HOW DO I DIG UP AND STORE MY DAHLIAS? HOW DO I PLANT MY DAHLIAS AND WHEN SHOULD I WATER THEM? PLANTING: Dahlia tubers may be planted 2-3 weeks before last frost as it takes 3 weeks for the sprouts to break ground. 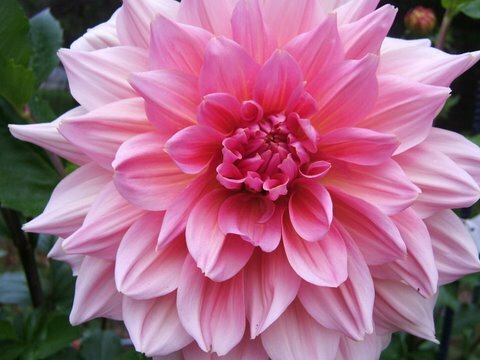 Dahlia plants should not be planted until all danger of frost is passed. The exact time varies with the locality. Too early planting may result in the tuber rotting in the ground. Check your soil for proper moisture, it is better to plant when the soil is slightly moist. Place stakes where the tubers are to be planted, labeling them with the name of the dahlia being planted. Remove about five inches of soil; place the tuber flat with the eye facing upward, about one-two inches from the stake. Cover the tuber with soil; it should be about five inches below the ground. The tubers should be planted shallower (three-four) inches in heavy soil. WATERING: Do not water immediately after planting. Too much water at this time can cause tuber rot. When the sprouts begin breaking ground, start watering. Normal soil should have a thorough soaking once a week. The soil should not be allowed to dry out during the blooming season. WHAT STORE POLICIES DO I NEED TO KNOW BEFORE I ORDER?